Scratch The Surface Texture Set, originally uploaded by SkeletalMess. Thank you, Jerry. These look great. Thanks so much! You are amazing. Oh, my. These are gorgeous. Thank you. Jerry... what do you do for a day job? I can only imagine all the time you spend making these wonderful textures. Thanks so much for sharing! Thank you so much! They are wonderful. These are fabulous....thanks so much! Another gorgeous set! Thank you so much!!! Very much appreciated. Love this look. There you go again with more beautiful textures! Thank you Jerry! These are just terrific, Jerry! Thanks so much for such generosity. Thank you so much for sharing this fab set! You are amazing!! These are fantastic textures. Thank you. Thank you so much for this Freebie. I want to let you know that I posted a link to your blog in CBH Digital Scrapbooking Freebies, under the Page 7 post on Jan. 23, 2010. Thanks again. Fantastic! Thank you. These will surely come to good use. Thank you - I am looking forward to creating with these! Awesome textures. Thanks for sharing! 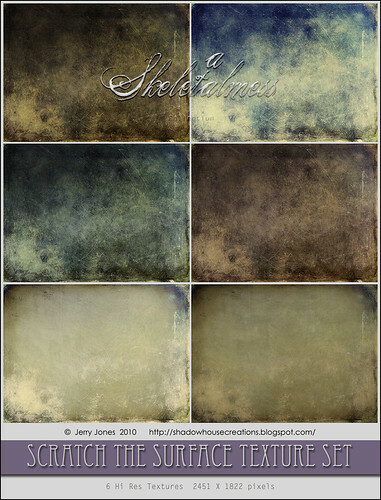 Thank you again for another wonderful texture set. Very creative. Lots of greetings from spain, asturias! Absolutely Outstanding! You are a Prince! Ooo this textures are soo fantastic!! Thank you very much for sharing them!!! Can't wait to try using textures on my photos!! Thank you so much! I love your textures! These are awesome. Thanks for your generosity, Jerry. Merci beaucoup Jerry ! Thank you so much ! Brilliant! And thank you SO MUCH!